Our story begins in 1984, when the company was founded by nutritional biochemist Henry Osiecki. Henry is better known in the industry as an award-winning biochemist, who introduced a number of key nutrients to the Australian market, including CoQ10, Lipoic Acid, Acetyl-L-Carnitine and Glucosamine. After years in clinic, Henry became frustrated with the lack of quality in practitioner-only products available for his clinic. He started Bio Concepts as the solution, after receiving seed funding from his wife, Dr. Vera Russo, who shared his vision of challenging the quality standard of natural healthcare in Australia. As the Osiecki's started to source manufacturers for their formulations, they discovered that very few of those manufacturers met Henry's standard for purity, and almost none disclosed excipients. Their solution to this was to start a manufacturing company, capable of redefining the standards for quality and purity of supplements; with full transparency of excipients in those formulations. The result was manufacturing company NPD, launched as a partnership in 1988. While NPD was eventually sold, its mark on quality standards has remained. Since day one, Bio Concepts has been committed to providing the highest quality products, with absolute transparency and disclosure of all excipients, believing every component matters when it comes to effective treatment. In his clinical years, Henry's approach to treatment plans was that they must always be tailored to the individual. As such, Bio Concepts formulations have always focused on providing the correct dosage for specific biochemical pathways, rather than just delivering the largest dose possible. To this day, we remain committed to maintaining that standard of treatment, following Henry's belief that to treat the condition, you must first understand the science. That desire to understand the science behind the conditions is driven by the Osiecki family's passion for education. Henry has written university courses, several books and scientific papers, and is the founder of the Bio Concepts Education Centre. The Osiecki family's passion for education has also inspired them to sponsor a scholarship for postgraduate researchers, contributing to the necessary travel, required to complete their studies. In December 2017, after running Bio Concepts for over 30 years, Henry announced his retirement, passing the reigns onto his son, Dr. Michael Osiecki. Michael has been involved with Bio Concepts his entire life, interning at the NPD laboratory as a university student and working in the Bio Concepts warehouse during his schooling years. 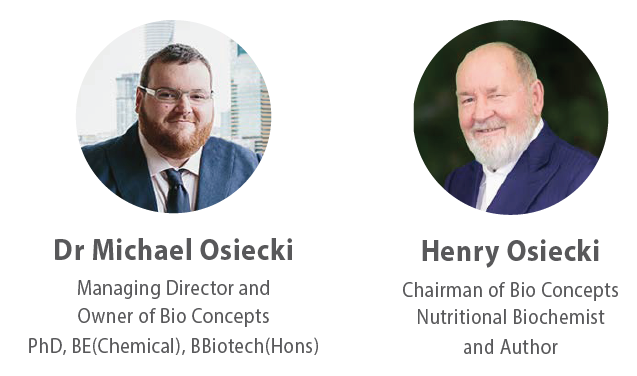 Following in Henry's footsteps, Michael developed his first formulation (Dr. Vera's formulations Epigene) while still at university, and has been heavily involved in the creation of many Bio Concepts formulations as we now know them. Michael's passion for both biochemistry and education has seen him travel around Australia and Internationally speaking to different conditions and treatments. His vision for Bio Concepts is that it should retain the values of a family-owned company, while maintaining a forward-thinking approach to continually improve the industry we love. Since day one, Bio Concepts has been completely family owned and operated, it is a part of our DNA that we are proud to bring with us as we grow. As one of few fully Australian owned and operated nutraceuticals company's remaining, we are passionate about empowering the industry to constantly grow, evolve, and improve standards for quality. for his outstanding contribution to the industry throughout his career! We couldn't be prouder!